Are you a business owner residing in Illinois, Indiana, Kentucky, Missouri, Ohio, Pennsylvania, West Virginia, or Wisconsin and looking to open a new business checking account? If your business has an average monthly balance of $25,000 up to $100,000, the Huntington Accelerated Business Checking Account is most ideal! In addition, this account is interest bearing, so you’ll earn interest on the funds in your account! The few benefits mentioned does not stop there. 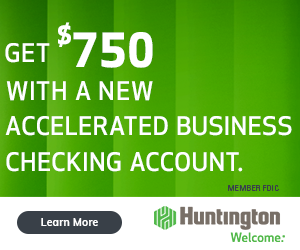 When you open a new Huntington Accelerated Business Checking Account and make deposits of at least $25,000 in cumulative deposits and 30 transactions within 60 days of account opening, you can earn a $750 cash bonus! To receive your coupon, click “Get Coupon” below. You’ll be directed to the offer page where you can enter your email to receive the coupon offer – from there, visit your nearest Huntington Branch (Locator) to apply! Huntington Accelerated Business Checking: If you are eligible for this bonus offer, click “Get Coupon” below to be redirected to the offer page where you can submit your email to receive your coupon offer! Once you receive your coupon offer, visit your nearest branch to apply! For our compiled list of Huntington Bank Deals, Bonuses, and Promotions, see our full list Huntington Bank Bonuses. To qualify for the $750 cash bonus, you are required to open a new, qualifying Huntington Accelerated Business Checking account during the promotional period, make cumulative new money deposits into the checking account of at least $25,000 or more and make at least 30 transactions within 60 days of account opening. Account must maintain an open account status for at least 90 days before it is eligible for the bonus payment. Enjoy up to 600 monthly transactions and then $0.50 per transaction over 600. Earn interest on your Accelerated Business Checking balance. Huntington will waive your $30 monthly service fee if you have $25,000 in checking balances OR $100,000 in combined business lending, checking, savings, CD and money market balances. Overdraft Protection Account with no annual fee (credit application and approval required), or Deposit-to-Deposit Overdraft Protection with no transfer fee. Their free, automated email Account Alerts can provide daily updates on your money. Learn More. Add a linked Business Money Market or Savings account and there is no Monthly Service Fee on that account. Learn More. Withdraw cash, deposit checks and cash, or transfer money between accounts for free, with Huntington ATMs. Find a local ATM Includes up to $50,000 in coin and currency deposits each month. A fee of $0.20 for each $100 deposited over $50,000 will apply. Have $100,000 in combined business lending, checking, savings, CD and money market balances. Definitely consider the Huntington Accelerated Business Checking if your business is excelling and you’re looking for a new fantastic business account to keep up and accommodate your needs. This account is ideal for businesses that are excelling and maintain an average monthly balance of $25K up to $100K. What makes this account better is that it’s an interest bearing account so you’ll definitely get additional return on your funds! Let us know about your experience with this account and the bank overall in the comment section below! Be sure to check back on BankDealGuy for more bank deals or anything Huntington Bank related here!